He's been described as humble and kind. But the unblockable Rams defensive end, who can bench press 500 pounds and tear a facemask off of a helmet, will mow down your QB without saying a word. Helmets, arms and shoulders hinder his vision, but Aaron Donald bulldozes his way through double-team after double-team. It's the first half of a Week 4 game against the Minnesota Vikings. Donald has yet to sack anyone in this game, or this season. He isn't worried, though. By the fourth quarter, the All-Pro defensive tackle of the Los Angeles Rams has had enough. He eyes QB Kirk Cousins and prepares to strike. NFL quarterbacks fear getting sacked by Donald in the same way ordinary people fear getting older: They know it will happen, and they know they can't do much about it. That doesn't make it any less terrifying. Not when 6'1", 280-pound Donald is mowing down 6'4", 350-pound offensive linemen and anyone else in his way. Take a Rams practice Donald's rookie year, back in 2014. An offensive lineman hit him after a one-on-one drill, and Donald grabbed the lineman's facemask and completely ripped it off the helmet. There was also one game in college at Pittsburgh when Donald tackled Duke's quarterback and running back at the same time in the middle of a handoff, leaving both men lying helplessly on top of each other. "You don't want to mess with that man," says Trumaine Johnson, a former Rams cornerback now with the Jets. "He's a one-man wrecking crew." Not even Donald's own teeth can catch a break. He used to chew through three mouthpieces a game at Penn Hills High in Pittsburgh, intimidating offensive linemen even before the snap. He was explosive then too, once tearing through a 200-pound resistance band that hugged his waist while he was running a 10-yard split. "Did you ever see Rocky IV, with the Russians? He would punch this machine, and the machine would register 2,000 pounds per square inch? Just forces off the charts? That's Aaron Donald," former Rams defensive line coach Mike Waufle says. "He has that kind of force in his body." Cousins felt it during that Vikings game. Donald grabbed the QB and threw him to the ground so effortlessly, so powerfully, that Cousins spun nearly 360 degrees on his way down. But Donald shrugs recalling that game, in which he finished with two sacks and a career-high 13 QB pressures in a 38-31 victory. Standing to the side of the practice field at the team's Thousand Oaks facility a week later, he's not quite frowning, not quite smiling. He looks a little bothered. "There was a couple rushes I know I had the opportunity to sack 'em, I let 'em get away," Donald says. His gaze catches the field again, like he wants another crack at it. "I know you ain't gonna win every single one-on-one, but in my mind, I'm supposed to." This is not hyperbole, not a sound bite for attention. Donald expects to get a sack every time he rushes the QB. He's disappointed when he doesn't. Not in a way where he berates himself or harps on plays for hours in a destructive manner. Instead, he approaches each down like he's on the verge of getting cut. Like he's not the second-highest-paid defensive player in NFL history (he is). Like he's not the best interior defensive lineman to ever play (he could be). On first glance, he doesn't look like he fits that description. Not just because of his shorter, leaner frame—jacked, but not necessarily imposing—but because he walks around like he's an ordinary person with an ordinary job. The 27-year-old is soft-spoken and economical with his words. Those who know him say he is quiet, humble, kind. Yes, kind. Even if Donald scuffled with Seahawks 315-pound center Justin Britt in Week 10, looking like he might bear hug the air out of his lungs after Britt shoved him out of bounds. Even if Donald then put his helmet back on after the Rams' win to personally seek out Britt for another fight and grabbed his facemask again. "He's a true gladiator," former Penn Hills coach Ron Graham says, "but he's a real likable guy." Donald's doughy cheeks accentuate his baby face, his gentle alter ego. He's funny. A little mischievous. Classic Aaron pranks include secretly sprinkling salt in a teammate's Gatorade and hiding helmets. "He's super playful. He jokes around," Rams defensive tackle Ndamukong Suh says. "But that turns into complete seriousness when we're on the field." Which is where he spends most of his time. On cue, Donald says, "My dad always told me, 'Hard work pays off.'" He says the words "hard work" and "work hard" six times over the course of 10 minutes that day after practice. Donald says these things not because they're his script, but because they're his compass—the guiding principles of his life. Bill Johnson, the Rams' defensive line coach, has never entered the team's meeting room without Donald already being in there first, dissecting film for hours on end. It is the "blue collar" in him, the Pittsburgh in him. Like a mechanic or a factory worker, Donald puts in an honest day's work. "He is either at his house or here," Johnson says. "He's sort of got a boring life." And he doesn't get much sleep. After evening games back in college, Donald would head straight to Pitt's D-line office and watch film of the game. Meanwhile, his teammates would be dancing, laughing, drinking into the night at Peter's Pub off Oakland Ave. As the moon disappeared in the black sky, Donald would pull four of Pitt's navy-blue office chairs into a single line and make that his bed for the night. He is still low-maintenance, hardly resembling his superstar counterparts in the NFL—the bright personalities whose popularity hinges as much on their branding off-field as their play on it. Donald is unique not just because there is no one at his size at his position who is as quick or as strong or as powerful (earlier this year, he bench-pressed 500 pounds), but also because he adheres to a concept that is not universally popular or glamorous: Work in silence, and let the results speak for themselves. "He will be in the Hall of Fame someday," Waufle says. Donald doesn't think about that. He doesn't think about racking up a franchise-record 12.5 sacks in this season's first 10 games, all while being double-teamed 70 percent of the time, per NFL Next Gen Stats. He doesn't talk about being the quiet leader of one of the NFL's loudest teams, either; the one who has the 9-1 Rams fantasizing about a deep run in the playoffs. He is still concerned with his missed sacks. "I just feel like I ain't played my best football yet," he says. Donald wasn't destined to be a Ram, as the franchise almost missed out on him heading into the 2014 draft. Some people within the Rams' scouting department were worried that he was undersized. That despite his impressive film, the leverage he was able to create and the lengthy list of national college awards bestowed upon him, he still wasn't tall enough, big enough. Waufle typically coveted big linemen. He spent five years as the Raiders' defensive line coach under Al Davis, whose teams were big and brutal. But Waufle saw something in Donald that you can't teach and shouldn't ignore. Donald was the best defensive lineman he had seen in his 20 years in the NFL. Hell, he was the best player in the draft, Waufle thought. Even though the Rams defensive line was already deep and wasn't in dire need of any new players, Waufle wrote Donald's name above eventual No. 1 pick Jadeveon Clowney on the team's mock draft board. Scouting reports be damned. About those scouting reports: The word "undersized" was practically superglued to Donald's name his entire life. He heard the description so often that he became numb to it. That was part of his appeal: He did not keep a running list of his doubters as other slighted prospects might. "He had great confidence in himself," says Paul Chryst, his former Pitt coach, who now coaches at Wisconsin. "He put all his focus and energy on what he could control." Because Donald knew he'd never pass the eye test for a defensive lineman, he didn't train like one. Starting in high school, he busted through agility cones and ladders and zigged and zagged before flying into endless green. He labored on technique, hand coordination—the small details bigger players might overlook. And he couldn't be contained. Donald was so fast that he used to intercept handoffs before quarterbacks could get the ball to the running back. He'd destroy players who were 6'7", 300 pounds and were receiving recruiting interest from programs like Michigan and Notre Dame. As a senior, Donald had 63 tackles, with 15 for a loss, and 11 sacks. But he received just four scholarship offers. Rivals.com rated him only a 3-star prospect. He didn't talk about it, didn't whine about it. Donald rolled up his sleeves and went back to work. By the time he arrived at Pitt, he was wrecking offenses so often that his coaches had to pull him out of practice. "He was that disruptive, that impactful," former Pitt defensive line coach Inoke Breckterfield says. "Thank God I never had to go against him," says Shakir Soto, former Pitt defensive end, now with the Raiders. "He's a silent assassin." As dominant as Donald was, the doubts about his size persisted until the Rams selected him 13th overall. Waufle made sure his first meeting with the rookie was to the point. The strategy for his first year would be simple: let AD be AD. "Aaron, don't listen to one word I say," Waufle said. "Learn the defensive part of it, but don't listen to anything technically, fundamentally, physically. "You keep playing your game. Just do what you do." The coach had never let a rookie go like that before, but he knew trying to change things could ruin an intuitive player like Donald. It could make him slow down, contemplate every move. The strategy was effective, as he terrorized quarterbacks. Donald eventually morphed into the 2017 Defensive Player of the Year. Someone who is unblockable. That's partially because he rarely wastes movement. He doesn't move side to side as much as some players do. He accelerates forward so quickly and with such force that offensive linemen are often overwhelmed. But few realize that nobody moves like him because few think like him. Say there's a car on the street. A red one. Donald and another defensive lineman are across the street, staring at it. They're asked to describe what they see. The other lineman might say he's looking at a red car. Donald, on the other hand, might say the front left tire is ripped, the bumper scratched and the front headlights dimmer than the back ones. This is how Donald analyzes football film: He obsesses over details and tendencies others might not recognize. Earlier this season, he was dissecting the angle and timing with which a certain guard's knee twitched. He stared closer, harder, plotting how he might react or even exploit the twitch. "He knows more about the offense than they probably know about themselves," former Pitt defensive end Bryan Murphy says. His devotion is obsession. Back in college, Florida State dismantled Pitt 41-13 to open Donald's senior year. Jameis Winston was commanding in his college debut. Donald had a respectable performance, recording a sack and three tackles, but as soon as Pitt returned to campus, he asked for the game video. He had to know what he did right, and did wrong, that night. "That was his fun," former Pitt defensive end David Durham says. "It's not like he was trying to beat the guy next to him. He just really loved watching film." Waufle remembers catching Donald in the Rams' facility parking lot at 6 p.m. on Christmas Day in 2015. He realized then that Donald had been there all day. More film. This didn't surprise Waufle, though. It used to tick him off when Donald would already be in the D-line office, jotting down notes, at 6 a.m. Waufle had to find a new room to prepare for the day. Donald doesn't do these things just because he wants to "be the best." He just doesn't want to be beat. It's noticeable when he's clobbered by double-teams. Some players, when they have little room to maneuver out of a jam, will give up on a play. They'll jog, maybe run to the ball. But Donald doesn't allow himself to quit, to ever be completely blocked. That's Pittsburgh again. "That's the way I was raised," Donald says. As a kid, Donald knew there were certain things he could do and certain things he couldn't. He couldn't cheat repetitions, and he couldn't make excuses. He saw how hard his parents worked, how hard everyone in his Pittsburgh community worked, and he knew he had to work hard, too. His father, Archie Donald, worked for a company that recycles tires, and his mother, Anita Goggins, was a bus driver. Archie started working out Aaron and his older brother, Archie, a linebacker who eventually starred at the University of Toledo, at 4:30 a.m. before school. They'd lift weights in the family's basement as Archie taught them discipline. "There was a code of conduct," former Penn Hills assistant coach Demond Gibson says. "It was the fiber of their family." When Donald wasn't getting recruited by many colleges, his parents stayed positive. But they also told him he wasn't owed any offers. "Keep working," Archie would tell him. Donald's goal, throughout two years of laborious negotiation and holdouts with the Rams, was to ensure his parents did not have to work any longer. So when he received his six-year, $135 million contract extension at the end of August, becoming the highest-paid defensive player in NFL history for 24 hours until Khalil Mack surpassed him, he felt immense gratitude. "My family, ain't no more struggling to pay this bill, pay that bill," Donald says. "If anything, it just motivates me to work a little harder," he says. "Anytime your organization invests a big amount of money like that into you, you want to do everything and more to thank them." DeWayne Brown, owner of Two Tenths Speed and Agility in Pittsburgh, has been close with Donald since his junior year of high school. Sometimes Brown jokes with Donald about how "big time" he's gotten, once leaving Donald a voicemail singing Michael Jordan's classic Gatorade commercial, with one exception: I wanna be, I wanna be, I wanna be like Aaron. Donald laughed it off, deflecting the attention. Similarly, Brown says Donald was quiet about the contract extension, feeling relieved and motivated. And something else: "He doesn't want to disappoint," Brown says. Not just himself, but his team. Until the Rams did. The team's defense disappeared in a Week 9 loss to the Saints, giving up 45 points and giving Drew Brees free rein. 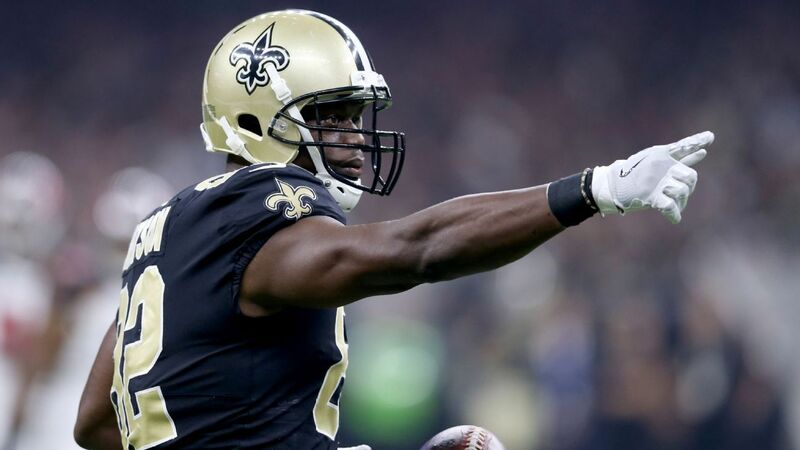 Brees' 72-yard touchdown pass to wide receiver Michael Thomas quelled any hope of a Rams comeback. Donald played every defensive snap for the first time in his career, but the Rams' flawless record now had a blemish. He doesn't say much about losses, leaving it to his play. Sometimes, though, he speaks up. Johnson, the Rams' defensive line coach, remembers a game last season, which he will not name, when his line spectacularly failed to execute on two plays. He was furious, but just as he was about to tear into the group, Donald stopped him. He told his coach something along the lines of, "Settle down, we'll fix it," Johnson says. "He was the one that set me straight," Johnson says. "His composure was better than mine." His teammates watch how he takes responsibility, even if a loss isn't his fault. They watch how much he agonizes over each missed opportunity. "He motivates me," Rams defensive end Michael Brockers says. "If I see him coming in here and working, I'm like, 'OK. I gotta get better, too.' He's definitely a guy that pushes you in that way." They also follow him because they like him. And each other. Though the defense gave up a season-high 190 rushing yards in Week 5 to the Seahawks, each of its players seems to like the other despite those moments. It does make a difference—liking the person next to you—when a loss (like the one to the Saints) can spoil a locker room like soured milk. That kind of camaraderie translates to the field, to coming back to practice after a loss and starting over as a unit. "[Head coach Sean] McVay talks about being yourself," Suh says. "He's not going to limit any of us by saying, 'You have to do it this particular way.' It's a team-oriented way." Donald was ready to attack as the Seahawks had the ball with about 20 seconds remaining in a tight Week 10 game. He had already been credited with 2.5 sacks of Russell Wilson. The QB has been one of Donald's favorite targets, as 10 of his 51.5 career sacks have come against him. But he wanted more. On second down, he crashed into Wilson, his pressure causing an overthrow. After Wilson threw another incompletion on third down, with the outcome of the game hanging in the balance, Donald chased Wilson again, tackling him a split second after he released the ball. He overthrew again, sealing the Rams' 36-31 victory. Afterward, knowing Donald, it's easy to imagine him in the film room obsessing more over those two sacks he missed than the 2.5 he made. Whatever it takes, he doesn't want to be beat.